Roads are still closed and properties evacuated on Monday morning following a fire early on Sunday morning. The danger started with a fire in the courtyard at the rear of Albany House, the flats on the corner of Ealing Road and Brentford High Street. Large piles of cardboard and other materials had caught fire around 00.30 on Sunday morning. Police and fire officials are concerned about the presence near the fire of large oxy-acetelene tanks - the type used for arc welding. As one of the officers attending the scene told BrentfordTW8.com, "These tanks can do two things. They can take off like a torpedo, smashing the walls, or they can just explode. Either way, you don't want to be too near it." 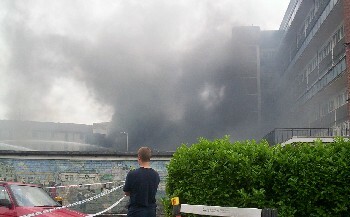 Properties were evacuated in the early hours, although some residents were unwilling to leave. Road closures due to be lifted at 01.00 on Monday morning were still in place at 07.30. Ealing Road junction with Braemar Road. Kew Road junction with Ealing Road is closed by the Waterman's Art Centre. The diversion for traffic from Hounslow to Brentford is on tothe A4 via Wilks Road, Albany Road, Brook Road South, Braemar Road and Ealing Road. Vehicles approaching from Chiswick and Kew, travelling towards Hounslow and Brentford, will be 'U' turned at EalingRoad.